Any marketer or media executive will probably tell you: Sports really is the most important type of video content today. There's the live or near-live nature of the games; the stakes—winning or losing; the passion and intensity of players, coaches and fans. All of those factors make sports video an appealing proposition for consumers and brands. Of course, as the media landscape changes—with consumers increasingly turning to mobile devices and expecting direct engagement with content—content is changing accordingly. Heed, a start-up app, is seeking to reimagine how sports is consumed in a mobile-first era, bringing together “the world of technology and data with the world of live entertainment,” in the words of CEO Danna Rabin. “We believe that sport has a lot of room for disruption in the way that consumers are consuming live events,” Rabin says. 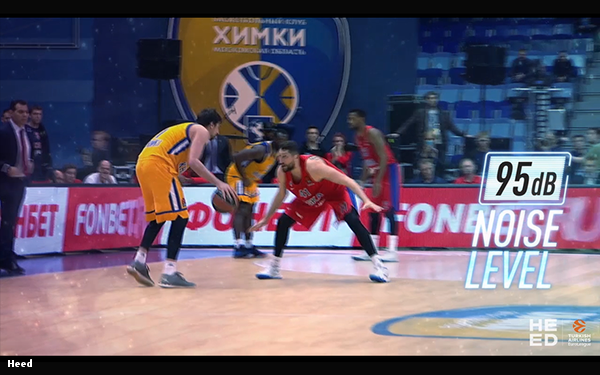 Using Heed, consumers checking out matches from the EuroLeague—or, soon, the UFC—can view highlights from games in near real time, punctuated with graphical overlays showing metrics like how high a basketball player jumped, or what type of punch a fighter just threw. Using proprietary sensors built into uniforms, gloves, or in the crowd, Heed also seeks to measure the intensity of players and noise level of the fans. “We are trying to unlock the spirit of live events,” Rabin says. “You aren’t there [in a stadium] because you get better access to see the game. It is because you can grasp the energy, the hype that a live experience gives you. Heed was established by technology entrepreneur Mati Kochavi and the sports and entertainment giant Endeavor, the parent company of WME-IMG, to provide a new sports experience for a younger generation. In addition to the EuroLeague basketball games, firms associated with Endeavor, including UFC and Professional Bull Riding, are on board, and the company is in talks with soccer clubs and other sports leagues about securing global rights to their games. Ultimately, Heed expects to build out its business by integrating both advertising and in-app transactions into its product. Heed plans to start by working with title sponsors for certain leagues and teams (EuroLeague is sponsored by Turkish Airlines, for example), and move on from there. The company has also been talking to consumer packaged goods and technology companies. “The word we are hearing more and more is ‘experiences.' [Companies] want to be part of new digital experiences that reach new consumers in a cluttered marketplace,” says Lawrence Norman, Heed’s head of business development. One such experience is expected to launch soon. Called Measure Up, it will let users submit videos of themselves making a sports move like attempting a dunk, and then measure their performance and compare it to others'. As technology allows content to be presented in new ways, content owners, whether programmers or sports leagues, will need to adapt accordingly. Heed thinks it has found a new way to deliver sports. Now the question is whether consumers and leagues are ready for that disruption.